The Nobo® Transparency range has been developed to give the widest compatibility, a full range of formats and a premium quality. Designed to give bright, vibrant colour reproduction and crisp black text – just the best presentation! 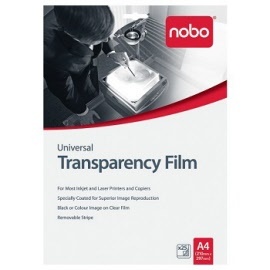 NOBO Universal OHP Film will save you time and money by purchasing one type of film for most printers. Suitable for most Inkjet and Laser Printers and Copiers. Specially coated for superior image reproduction. Black or Colour Image on Clear Film with Removable Stripe. 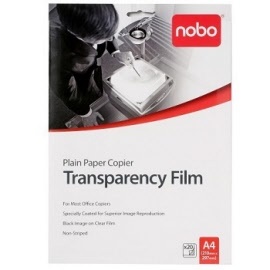 NOBO Plain Paper Copier OHP Film is suitable for most Office Copiers. They can be used in most office copiers as they have no sensing strip or notched corner. Black or Colour Image on Clear Film. Non-Striped.